To be honest, I was thinking of skipping writing a post here this week in order to work more on “Aanora” today, but then I decided to write a short update on where I am with all my writing now that I’ve become accustomed to my fulltime work schedule during the week. Actual writing at the computer (or handwritten) occurs on the weekends. Thinking and imagining occurs all the time, even when I’m at the day job. During this past week, my printer at home began sending me error messages that the ink pads were almost full which for my particular model apparently means that I need a new printer. Too bad. I love this printer. It has served me well for the last four years. So this means that until I get the new printer, I won’t be printing out much of what I’m writing. I usually print out a draft and do revision work by hand rather than on the computer. This could also be a motivation to hurry up and buy the new printer. “Light the Way,” the sci fi short story whose first draft I finally finished this summer is still fermenting. I think I printed out the first draft at the time I finished it, so I could do some revision work if I get stalled on the “Aanora” story. Clipped a nice story from the newspaper this morning about Copenhagen, Denmark, one of the settings in Perceval’s Shadow, the second novel in the Perceval series. I’ve discovered that Google Maps can be especially helpful in researching locations also. I’m almost to the point with this novel where I no longer feel daunted by it. Revision work could start at any time. What has been preoccupying my mind (and imagination) though is the “Aanora” story. Yesterday I worked more on the rough outline in order to work on the second act, i.e. the Conflict/Obstacle Act. I want the conflicts and obstacles to evolve organically out of the characters (what I want with every story), so it’s been necessary to think more about who the villain is. Now I know who the villain is and what he wants, but he’s not the only obstacle in the way of the main character achieving what he wants. I realized yesterday that the main character is probably his own biggest obstacle. So this could be a challenge. I understand now that Aanora is so important because she will help the main character overcome himself. Not quite sure how that will happen yet. I also have the climax sequence in my head but haven’t yet written it. Working on “Aanora” has been a weird experience for me. Instead of the story unfolding through a main character scene by scene, I’ve had scenes from different parts of the story come to me. It feels a little like my imagination has thrown a bowl of spaghetti at the wall of my mind to see how much of it will stick to it. I’m frantically trying to save all the strands to see where they fit later. Fortunately, the characters continue to intrigue me and I’m enjoying spending time with them as well. I do miss my fulltime writing life…..
Adam Burns has been on my mind a lot lately. He was an old guy, a bum, a journalist in hiding in a very early draft of Perceval’s Secret. Evan Quinn met him once, in a wooded area not far from the Minneapolis neighborhood where the Quinns lived. Evan was ten years old. He knew Adam as “Old Man Burns,” the neighborhood drunken bum. The encounter Evan has with Adam brings into laser sharp focus for Evan the danger that his family is in. Adam isn’t really drunk when he meets Evan — he’s acting drunk and stupid — and he tells Evan that his father must leave the country. Later, Evan learns that Adam was murdered, his body found along the Mississippi River, a bullet in his brain. I killed off Adam Burns and that entire encounter with Evan. In fact, just before Evan meets Adam, Evan and his friend Paul Caine have been hounded and abused by Harold Smith and his gang. I didn’t realize it at the time I cut out that entire section of the draft, but Harold Smith would become Evan’s nemesis in the Perceval series. He survives in flashbacks in Perceval’s Secret as well as in the flesh late in the novel. But I never put the childhood section back into the novel. And Adam Burns was lost, except in my mind. Now he haunts me. Have you ever been haunted by characters that you’ve cut out of stories or novels? It’s strange. It’s like they want their own stories, they do not want to be forgotten. I have yet to figure out why Adam keeps popping up in my mind. What’s his deal? 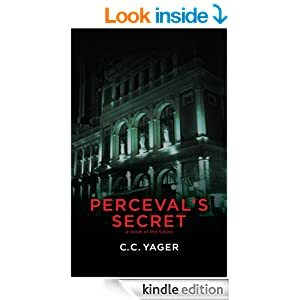 When I began work on the Perceval series, it wasn’t a series. It wasn’t even a novel. It was a short story about a ten-year-old boy who wanted to be an orchestra conductor when he grew up, but the circumstances of his life in America in 2048 would make that dream impossible to fulfill unless he left the country, according to Adam “Old Man” Burns. Evan senses that Burns has a secret, and indeed he did. I knew his backstory although I never wrote it. It was enough that it was secret and something dangerous that Burns must protect or he could lose his life. Adam’s backstory: first of all, Adam Burns wasn’t his real name. He made certain no one knew his real name, including me. He’d been a famous journalist on the East Coast during the Change, the period of time during which the New Economic Party (NEP) consolidated power in America with a permanent majority on the federal and state levels of government. Like any journalist worth his salt defending Freedom of the Press as well as the Bill of Rights, Adam had reported on those in power, exposing their corruption, greed, and lust for power. He’d reported on their narcissism, comparing them to the greatest dictators of the 20th Century. He knew the NEP cared only about enriching itself and insuring that they got everything they wanted. Adam had reported also on the Resistance, the Underground, and the Civil War. But the NEP wanted the American people to know only what they told them. So they waged war against journalists, arresting many who simply disappeared. The NEP wanted complete control over the media. They silenced the media by any means necessary. The people had rebelled — the country was embroiled in a Civil War, with western states seceding, southern states threatening to do so, and Washington slamming shut all of America’s borders. By the time Evan is ten, Adam has been underground for over five years, running for his life. In Minnesota, he thought he’d be safer because Minnesota was a hot bed of resistance, led by Evan’s father, a poet, and Paul’s father, a composer. Artists throughout the country had joined the Underground, the loosely organized resistance movement. They could offer Adam a way out of the country. I cut Evan’s childhood section when I realized that I was writing a novel and I needed to restructure it to focus on his adult life, what eventually became Perceval’s Secret. Now I find it a bit ironic that Evan carries a dangerous secret in the novel, one that could cost him his life. So perhaps Adam did survive in the importance of keeping dangerous secrets. Every year I look forward to the Minnesota Orchestra’s Future Classics concert, the culmination of a week of seven young composers chosen by the Composer Institute‘s composer-director, Kevin Puts, working with the Minnesota Orchestra. I cannot say strongly enough how much I love this concert. It is my favorite in the Minnesota Orchestra’s concert season. The Orchestra and their Music Director, Osmo Vanska, have committed to bringing promising young composers to Minneapolis for a week of seminars on composing for an orchestra as well as the business side of composing, and they have opened the rehearsals to the public each year. I used to attend the rehearsals, but my part-time job now prevents me from attending them. I attended the Future Classics concert, however, last night. How are young composers thinking this year? Are they using conventional musical structures like rondo or sonata that composers in the past found so challenging and inspiring to their musical imaginations? Will there be any lyrical melodies this year? How will the composers use the orchestra? Will they engage all the instruments or focus more on one section like percussion? These are the questions in my mind as I take my seat in Orchestra Hall. Fred Childs, from Performance Today on public radio, hosts and introduces each young composer before his or her piece is performed. What struck me this year was how young they were. They are at the beginning of their creative output and still growing into their musical voices. Some have already enjoyed some success with their music. At least one was hearing their work played by a full orchestra for the first time. But overall this concert was a showcase for potential. Also in my mind is my composer, Owen te Kumara, in the Perceval series that I’m writing. At the rehearsals of the first Composer Institute I attended, I sought a composer with whom I could talk about the composer’s life, to be a reference source for me while I developed Owen and how he’d fit into Evan Quinn’s life. Owen is not a young composer just starting out. But the elements of a composer’s life are the same in 2048 as now. So for me, the Future Classics concert is still research, a way to touch base with a composer’s world and remind me of how they pursue their art. The music displayed great potential. When I look at the notes I wrote last night, I see over and over “good orch” which means a good use of the orchestra as a full instrument rather than sectioning out the sound. I also noted far less emphasis on percussion which pleased me a lot. Not that I dislike percussion, but when a composer is using an overabundance of it, the experience is one of only sound effects rather than music. A really lovely surprise to see the harp used prominently as well as brass and piano and…oh, my, god, strings. And another interesting experience was listening to the instruments blended but at the same time used in unconventional ways to produce unconventional sounds, e.g. sliding the strings or doing quarter steps, muted trumpets and trombones in different ways. And there were a couple pieces in which I sensed a story being told. Programmatic music was the norm, i.e. music inspired by an event, experience, a story, a character, a landscape, etc. It was fun. During the Q&A with the audience after the concert, one guy asked if any of the composers used musical forms such as rondo or sonata. The composer who answered stated rather emphatically that those “archaic forms” were irrelevant to her as a composer. That made me smile. After all, programmatic music is also a very old form, and that composer as well as the majority of them had written programmatic music. The next question came from a guy who sounded irritated when he asked if composing in a key was irrelevant, too. I thought: and now these young composers are coming face to face with an audience, and what the audience wants to listen to, in fact, demands from them. Another composer tackled that question by pointing out that it was impossible to write atonally, i.e. without a key, when writing tonally, but they still played with pitch. They were all amazingly articulate when talking about their music, but I was left a little disappointed. I began thinking about my experience as a writer and how I had wanted to write the way I wanted to write and not be constrained by any kind of narrative structure or rules governing plot, character development, story, or dialogue. Writers experiment with form as much as any artists, but an interesting thing often happens. With me, too. I discovered that artistic forms or structures challenge the artist to be creative within the form and that paradoxically liberates the artist to truly be creatively expressive. Furthermore, readers might read one or two experiments but will always return to the “ancient” narrative structure called 3-act dramatic narrative. Within that “ancient” narrative structure, a writer can do anything. So, I smiled when that young composer stated that those “archaic forms” of rondo and sonata (and others, I’m sure) were irrelevant to her. She was well on her way to discovering just how relevant they could be to art if she was truly as open to her art as she seemed to claim she was. Osmo Vanska spoke about how he and the Minnesota Orchestra wanted to insure that there would be good orchestral music for future audiences. They are committed to finding young composers to support and help through the Composer Institute. Kevin Puts, the Composer Institute Director, brought the evening to a close by commenting that composers needed to understand that it was great to experiment while in school, but afterward, they needed to consider creating music for subscription concert audiences which received loud applause. Undoubtedly, the Composer Institute and the Future Classics concert are important experiences for these young composers and I suspect will change them in ways they cannot even know right now, but I hope will discover when the time is right. And now I can’t wait for next year’s Future Classics concert…. Evan Quinn, protagonist of the Perceval series, earns his living as a symphony orchestra conductor. As a result of his choice of profession, I researched conductors, conducting, and everything related to them for several years. One of the conductors I spoke with was Sir Neville Marriner, so when news of his death at 92 two weeks ago came, I felt especially sad and flooded with memories of my experience with him and his wife, Molly, when I worked at the Minnesota Orchestra in the 1980’s. I requested 20 minutes of Neville’s time to ask him about European orchestras, how they function compared with American orchestras, and how conductors respond. When I walked into his office, he stood and extended his hand with a genuine smile. Then he offered me a cigar. I laughed and declined. We began talking, and soon I realized that my 20 minutes had passed. But Neville continued to talk, answering my follow-up questions. I realized that he was enjoying our conversation. After 45 minutes, I finally stood to go, thanking him for his generosity and time. Outside his office, a line of people waited. What Neville told me informed my writing in Perceval’s Secret and continues to serve as a foundation for the series. In talking with people who also knew him, I learned how much he loved talking with people, that he enjoyed being with people, that his wife, who also worked as his manager, had the huge challenge of keeping Neville on time with his schedule when he was in a particularly social mood. I was always grateful for the time he gave me, and for the knowledge and experience he shared with me. Another conductor that has been on my mind recently is Stanislaw Skrowaczewski, Conductor Laureate of the Minnesota Orchestra. This month, he celebrated his 93rd birthday. I’ve written about him before when I reviewed the biography Seeking the Infinite that Frederick Harris wrote about him. He’s an amazing guy. I saw him conduct Anton Bruckner’s 8th Symphony last weekend with the Minnesota Orchestra. This symphony was the first Bruckner symphony that I really heard. I love it. When Maestro Skrowaczewski walked onstage, the audience erupted, leaping to its feet in a raucous standing ovation that astonished me. From his expression, it astonished Skrowaczewski, too. He has aged, appears frail, stooped, and thin. I wondered if he’d make it through the 83-minute symphony. I needn’t have been concerned. With the downbeat, it was as if he was 20 years younger, and considering that he was climbing mountains still in his 80’s, that is truly younger. He conducted the entire symphony from memory. His baton technique has become economical, and he moves very little on the podium. This orchestra, however, knows him well. I was astonished by the inner voices that he brought out in the symphony instead of focusing only on the main melodies and big moments. A co-worker called it a “slow burn.” It was indeed. Captivating, deep, and spiritual, as the devout Bruckner’s music should be. Another surprise after the symphony ended. Yes, the audience gave him and the orchestra another standing ovation. What was unexpected was the orchestra musicians’ response: applauding him, stomping their feet. This is quite the compliment given by orchestra musicians for a conductor. And profoundly moving. Neville Marriner succeeded Stanislaw Skrowaczewski as Music Director of the Minnesota Orchestra in 1979.